This Cabin is newly built (2005) and right on the waters edge. It is part of a family run resort, The Lodge on Otter Tail Lake. Open year round it has 2 bedrooms down stairs with a queen and double bed and then a 3rd bedroom in the loft with 3 built in twin beds. Full kitchen including microwave, coffee maker, stove fridge and dishwasher. Part of the Lodge on Otter Tail Lake with 14 cabins. Daily activities for guests during the Summer. Full marina with boat rentals by the hour, day or week. Great sand beach with free non-motorized watertoys including paddleboards, paddleboats and canoes. 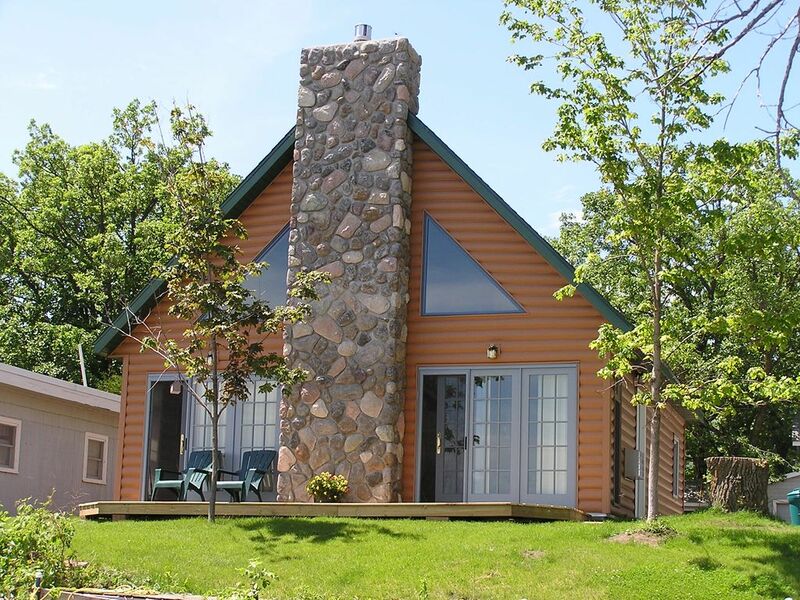 On the west Shore of Otter Tail Lake known for Walleye fishing and great water recreation. Full Marina. rental waterskis, wakeboards and tubes. Run down and in need of repairs. Never saw owners. It's a beautiful cabin, but there are so many things in need of repair!! I was disappointed with the kitchen supplies. For the price you pay per night, it really wasn't up to par. We are sorry you did not find the cabin to your liking. This is a rare complaint for this property and we do take it seriously. We have forwarded on to the owner of the cabin your request for updated kitchen supplies. We would have been happy to assist you during your stay with anything that was unsatisfactory. Unlike many VRBO properties, we are onsite. We list our phone numbers to you prior to arrival and they are also posted on both entrances to our lodge/office which is located next to your cabin. The owner of this cabin will be discontinuing rentals in a few weeks to remodel. Once again thanks for your communication. It helps us to provide a quality vacation rental. We enjoyed our stay in your cabin and loved the lake! From check in through check out - this was a great place to stay. The beds were comfy - the location was great - even had a fire and made s'mores.... the kids love the beds upstairs in the loft and it was a great stay. I highly recommend it! We visited Paul and Deb's lovely property while staying on Otter Tail Lake for a wedding. Our cabin was the perfect combination of location and amenities. Loved waking up to the lake right outside our windows, and appreciated the convenient access to nearby restaurants and shopping in Battle Lake. Good spot! Glad you enjoyed the cabin. Hope the Wedding festivities all went smoothly. The cabin was as it looks in the pictures. The lake is really close so that was nice. The cabin had a lot of bugs (ladybugs/spiders) there was spider webs and some of the areas weren't very clean. It was Oct when we stayed so it was cold and my kids wanted to stay inside and watch movies on their Ipads, but the WiFi didn't work so that was not great either. Paul and Deb seemed nice, but just not very responsive to fixing the WiFi issue. The game was ok, but not really great for younger kids. It was great that they had ice cream and food etc. there you could buy. For the price I would have rather stayed at a hotel, and got my room cleaned and had working WiFi and pool since it wasn't nice enough weather to really be outside when we stayed. Thanks for your comments. This really is a beautiful cabin. The pictures are accurate, but they can't capture that view of the lake from the deck 25' from the water. We are sorry your stay wasn't blessed with warmer weather. That is always a chance taken in Northern Minnesota in mid-late October. We hope the gas fireplace with that awesome stone chimney kept you warm. We do have to apologize for the wi-fi issues during your stay. I did reset the router twice per your request. I am not sure if your devices were having troubles connecting, but I was connected to the same wi-fi at work during your whole stay. We are a remote facility and the internet options in our area are limited. We will be upgrading our Internet to be more direct to each cabin in 2017. We realize this doesn't help you for the times it was down during your stay. As for 'Lady Bugs" and spiders, they can be a nuisance in the fall. The lady bugs are actually Asian lady Beatles that are helpful for area potato farmers. Since we are located in a rural area, we get an increased number of these in the late fall after the potato harvest. Generally we don't see too many of them. We do spray for spiders every spring. This has been very effective in minimizing their numbers. In the future, please mention these pests during your stay. We are more than happy to help you with them. We are glad you were able to enjoy a couple days with your family this October. We invite you to come back next spring or Summer when Otter Tail Lake can really show you why it is one of Minnesota's best lakes! Beautiful Lake with the cute,cozy cabin so close to the water! We went in October so we were glad to have a fireplace. We looked for Northern Lights at night and the sun came out during the day to warm up enough so that we could canoe on Otter Tail Lake. Fun!